This Is Your Brain on Ebooks . . .
Kindles, Sony Readers, Nooks, and other forms of ereaders have been prominently in the news during 2009. The long-heralded arrival of ebooks as a significant factor in the publishing industry finally seems to be here. We pondered the implications recently in Manhattan over coffee and tea with Chris Kerr, the senior partner in the Parson Weems sales group that represents NewSouth in the northeast. (We have sales reps in each region of the country to call on bookstores, chains, and wholesalers.) Chris is a 30-year veteran of book publishing and is one of the smartest, savviest book people we know. He asserts that this time around, the ebook is real. Despite their high cost, both Amazon’s (the Kindle) and Barnes and Noble’s (the Nook) ereaders have been selling briskly, and rumors are rampant about Apple’s imminent entry into the category. One of the problems up to now has been a chicken and egg issue: so few people have had the ereaders that publishers didn’t have motivation to offer many titles as ebooks, and because there weren’t many ebooks available, people didn’t buy the readers. A tipping point seems to have been reached, and now publishers large and small are adding ebook editions as quickly as they can. Another problem—for publishers—has been that there’s no standard format for ebooks; the Kindle, for instance, uses a proprietary format that won’t work on the Sony or B&N devices. However, the conventional wisdom is that a standard format is or soon will be emerging, which will leave publishers free to worry about other thorny issues such as retail pricing models, piracy, and how to calculate (and/or negotiate) author royalties. Like other book publishers, NewSouth is watching closely to see which standards emerge so that we can more confidently offer our titles to readers who want them in electronic formats. Presently, less than a fifth of our titles are available as ebooks; we plan to have them all in ebook format of one variety or another by the end of 2010. Going forward, we’ll probably produce print and ebook editions simultaneously. Some people can’t wait to get their hands on an ereader; others say the last thing they want is to read a book on a digital screen. Fair enough; traditionalists can save several hundred dollars, and the early adopters can sprint through the airport confident they have enough reading material to keep themselves occupied during their Grand Tour of Europe—in a device that fits in their palm and weighs less than a pound. To each his own. But what of the experience of reading on a digital screen? What will that feel like? What does it portend for literature, for comprehension, for the future of writing and reading? Back in October the New York Times asked several smart people for their opinions on these questions. You might find their responses interesting and can read them here. If you’ve never read a forensic audit (or even if you have), Professor Leslie Fletcher of Georgia Southern University’s Business in Savannah magazine recommends you check out Rich Whitt’s Behind the Hedges: Big Money and Power Politics at the University of Georgia. Whitt’s startling expose of funding controversies at the University of Georgia includes an examination the 2003 Deloitte & Touche forensic audit prepared for the UGA Foundation to invesitage the misuse of university funds. Among the issues addressed in the audit, reprinted in full in the appendix of Behind the Hedges, are the expenses and compensation of continuing president Michael Adams, stipends paid to the president’s wife, a $250,000 salary side-deal for football coach Jim Donnan, and the unapproved purchase of a facility in Costa Rica. Behind the Hedges is available at your favorite local or online bookstore, or direct from NewSouth Books or Amazon. Rebecca Mitchell, Director of Alabama Public Library Services, and NewSouth Managing Editor Brian Seidman recently sat down with Tonya Terry on WSFA News at Noon’s “12 Talk” program to discuss The Adventures of Tom Sawyer and the origins of Alabama’s first ever statewide Big Read program. It’s not often that a regional publishing house like NewSouth Books is afforded the opportunity to publish a work for their state’s Big Read program. NewSouth’s edition of The Adventures of Tom Sawyer is unabridged and annotated, and carries a special forward by local Twain scholar Alan Gribben, and includes an NEA Reader’s Guide. NPR’s Debbie Elliott visited with syndicated columnist Rheta Grimsley Johnson in Henderson, Louisiana recently, to learn about the place Rheta calls her second home. Henderson is the subject of a memoir by Rheta Grimsley Johnson, called Poor Man’s Provence: Finding Myself in Cajun Louisiana, published by NewSouth Books. The All Things Considered program that resulted aired November 30. To hear the entire interview, visit the NPR website. 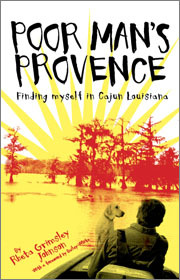 Poor Man’s Provence is available directly from NewSouth Books, from Amazon.com, or your favorite local or online book retailer. The Montgomery Independent recently interviewed Eddie Phillips, author of the newly published The Other Side of Montgomery: Growing Up White in the Birthplace of the Civil Rights Movement, and spoke with him about his memories of a Montgomery, Alabama not often found in history books. In the interview, Phillips discussed a variety of subjects including growing up sheltered from the racial tension prevalent in Montgomery during the period. “Our parents probably did a great job of sheltering us from all of [the news coverage],” he said, noting that it was only later he began to appreciate the remarkable social changes underway at the time. Phillips also remembered fondly his teenage years, a time when many of his classmates’ greatest cares involved “who was dating whom” and the crosstown rivalry between Lee and Lanier High Schools. One memory Phillips discussed in his interview that particularly stuck with him was when he joined his mom when she drove their black housekeeper home one day. What he saw was a poor neighborhood he didn’t even know existed. Ranging from his early childhood to his senior year as starting quarterback at Lee High School, The Other Side of Montgomery provides a look at life during the 1950s and 60s both removed from and affected by racial tension. Youthful exploits, tacky Christmas decorations, front porches, and backyard barbecues. . . . These are remembered fondly and described with wit. Eddie Phillips is a lifelong resident of Montgomery, Alabama, recently retired from public service with almost thirty years of professional management experience in state and local government. This book is is his second publication; in 2005 he penned a collection of satirical poems entitled Left for Dead in the Corner Cubicle. The Other Side of Montgomery is available directly from NewSouth Books, or from your favorite local or online retailer. The New York Times recently quoted Julie Hedgepeth Williams, author of the forthcoming Wings of Opportunity: The Wright Brothers in Montgomery, Alabama, 1910, in their “The Caucus” political column “If Fox is Partisan, It Is Not Alone.” The article explores the role partisanship plays in the coverage of politics by the modern American media. Quoting from The Early American Press, 1690-1783—a book Williams authored with William David Sloan—the article discusses the American press in its infancy and the early beliefs held that the press was expected to be explicitly partisan. Julie Williams is no stranger to journalism or the history of the American press. She began her career in journalism as a staff member of the Sampson Independent in Clinton, North Carolina, where she worked for seven years before returning to school to receive her M.A. in Journalism and Ph.D in Mass Communications from the University of Alabama. Williams is currently a professor of journalism at Samford University, a position she’s held since 1994. She’s also authored several books, including the aforementioned title as well as The Significance of the Printed Word in Early America: Colonists’ Thoughts on the Role of the Press and the forthcoming NewSouth title Wings of Opportunity. Wings of Opportunity will be available in January 2010 from NewSouth Books, Amazon.com, or your favorite local or online retailer. Charlottesville, Virginia’s Daily Progress recently interviewed Paul Gaston—renowned historian and author of the newly published Coming of Age in Utopia: The Odyssey of an Idea—in anticipation of his upcoming book launch and signing on December 3 at 5:30 p.m. at the New Dominion Bookshop. Professor emeritus at the University of Virginia, Gaston will be reading from his new memoir and leading what is sure to be a deeply engrossing discussion. In Coming of Age in Utopia, Gaston’s first book-length work in recent years, he chronicles his story of a committed life and reveals his deep roots in the unique utopian community of Fairhope, Alabama founded in 1894 by his grandfather and later led by his father. But by the 1950s, it was clear that great changes were coming to the South, and Gaston began looking outward for ways to take part in the civil rights movement. Gaston’s career at the University of Virginia, where he taught from 1957-97, forms the core of Coming of Age in Utopia, and the story Gaston tells of social change both in the city of Charlottesville and the University of Virginia is one in which he played a significant role. He related that role and the vision behind his new memoir in a recent interview with the Charlottesville Daily Progress. “I wanted to show that struggles for social justice don’t come easy, and they’re easily thwarted. And, I guess, insofar as I had a philosophical or historical point to make, it’s that when privilege is deeply engrained, change isn’t going to come from above—it has to come from below. Read the full article at the Charlottesville Daily Progress website. The Hook, Charlottesville’s weekly independent newspaper, also recently took note of Coming of Age in Utopia and Gaston’s upcoming New Dominion event. Read the full article at The Hook website. Coming of Age in Utopia is available from NewSouth Books, Amazon.com, or your favorite local or online retailer. Patrons of the We Piddle Around Theater in Brundidge, Alabama will get a special Christmas treat this year when renowned author Kathryn Tucker Windham regales them with her delightful holiday tales during storytelling concerts on December 4 and 5. The event, sponsored by the Brundidge Historical Society, includes a chili dinner. Local paper Troy Messenger has details. Mrs. Windham will begin the new year as the special guest of the Osher Institute for Lifelong Learning of Auburn, Alabama’s Winter General Membership Meeting on January 11. She will tell tales and sign copies of her books Alabama, One Big Front Porch, Jeffrey’s Favorite 13 Ghost Stories, and her newest, the memoir Spit, Scarey Ann, and Sweat Bees: One Thing Leads to Another. On January 15, she will appear at the Kathryn Tucker Windham Museum at Alabama Southern Community College for a book signing. On February 27 Trinity United Methodist Church in Huntsville, Alabama will welcome Mrs. Windham to the 15th anniversary of “Tell Me a Story.” Mrs. Windham helped to launch this storytelling festival in 1995, when organizers planned for what they thought would be a one-time session. An overwhelmingly positive response from festival-goers resulted in the establishment of an annual event. Kathryn Tucker Windham has participated in all but one of these. The festival includes workshops for would-be storytellers of all ages. For a sample of Mrs. Windham’s wit, listen to an interview by Joey Brackner from the Alabama Arts Radio Series. We hope you’ll be able to join Mrs. Windham at one of these great events! You are currently browsing the NewSouth Books weblog archives for December, 2009.